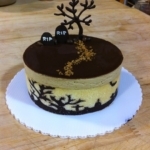 The focus this week was our big fondant cake project, but we kicked it off with wrapping up service and plating on Monday and Tuesday. I usually end each post with a list of what we made each day… that’s not happening today, as it would take me forever to write it out. Instead, here’s a picture of all of the recipes. Granted, we didn’t make it all today… some stuff we did the following day, and a couple things we already had from before. Still though, I think we made about 20 recipes today. I added it up to Ryan that night because it was so ridiculous. Needless to say, it was a long day, and Lindsay and I were completely exhausted by the end of it. This was all in prep for tomorrow’s final Service Day. I think the only pic we got from today was us making the strudel for the 4th recipe. 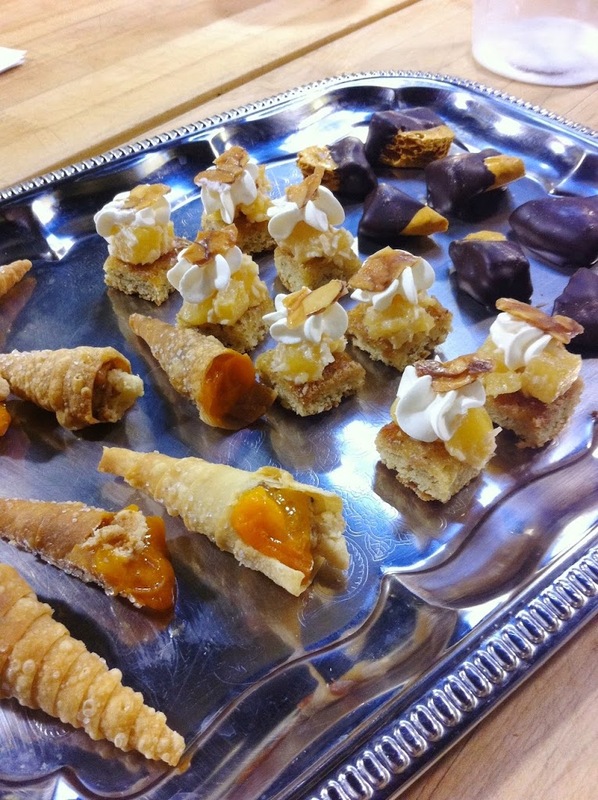 The whole class just ended up using our strudel for their cones, since it seemed to be enough for everyone. This was great for everyone else, as they didn’t need to make their own strudel, but it took up our entire station and ended up taking longer than we’d planned, which set us back a bit for all of the other recipes. 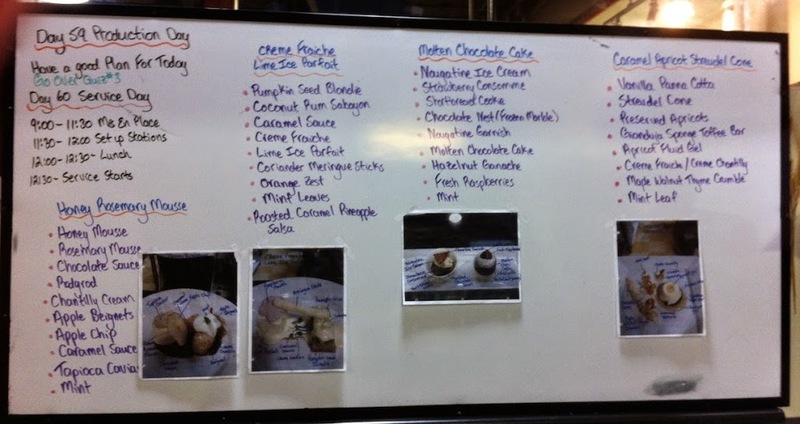 Not a whole lot to say about today… we finished up some final recipes that we’d need for the plating and moved on to service in the afternoon. 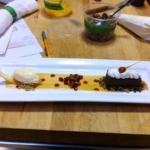 It was much the same as last week, with Chef Jonathan calling out the orders and Chef Stacy judging our presentation. The key difference this week was there were a LOT more components to each recipe. Personally I felt like most of these had a bit too much going on, but it was a good exercise nonetheless. 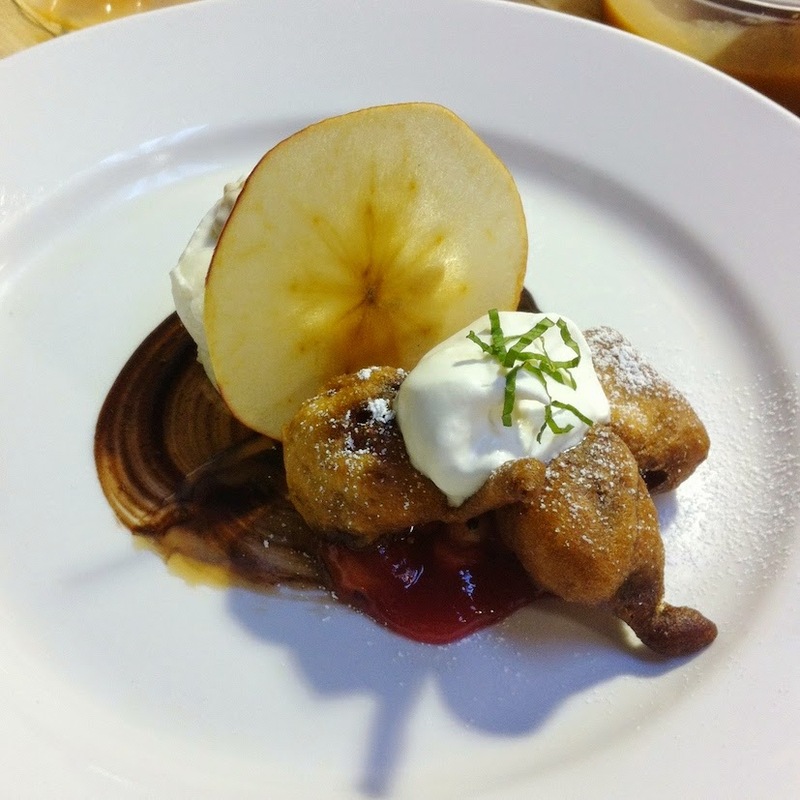 Honey rosemary mousse with tapioca caviar and apple beignets. 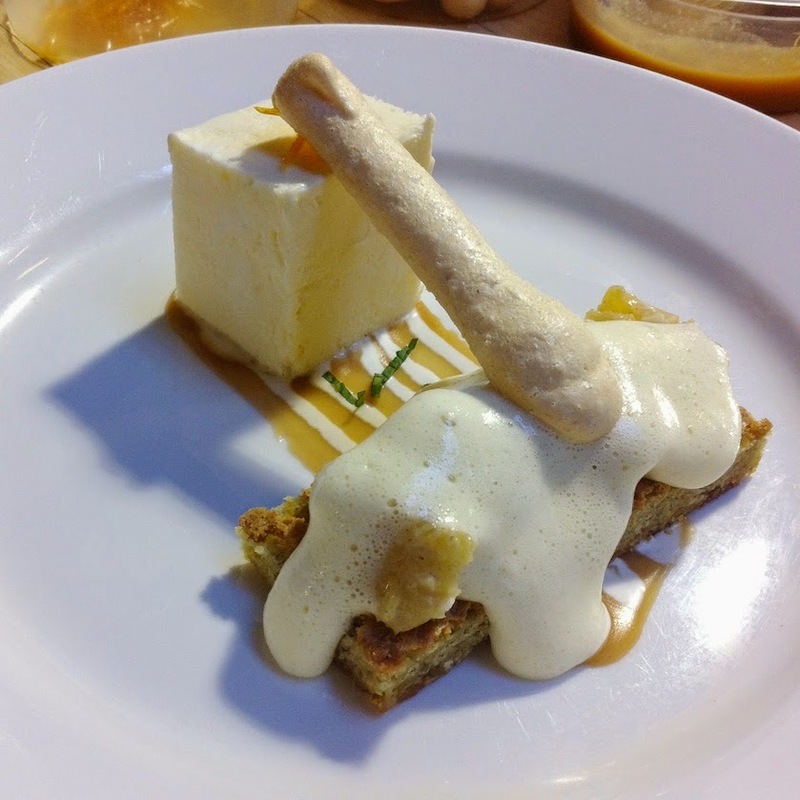 Lime ice parfait with a pumpkin seed blondie. 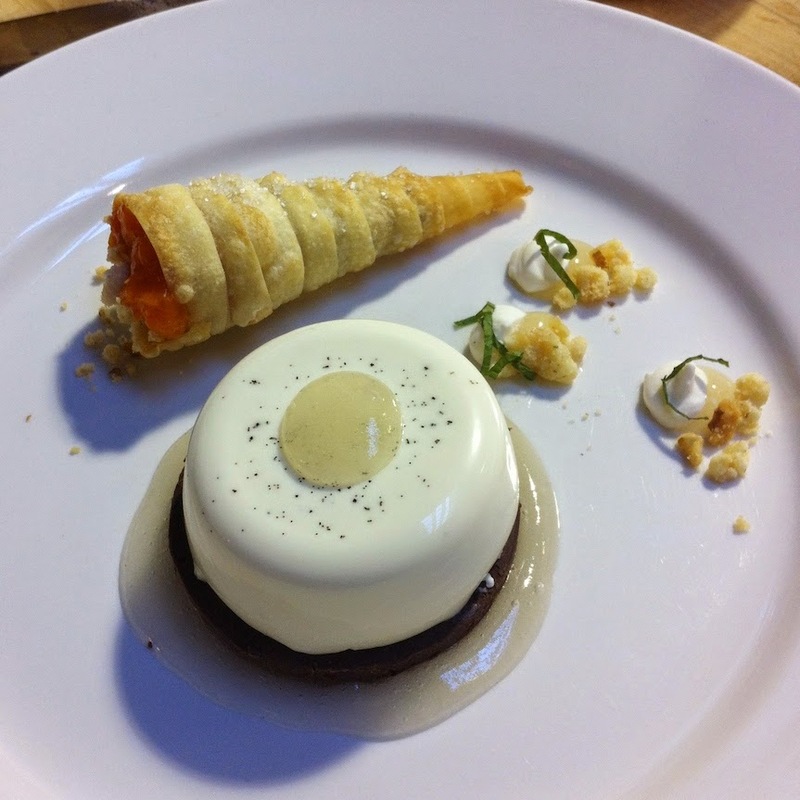 Vanilla panna cotta with an apricot strudel cone. 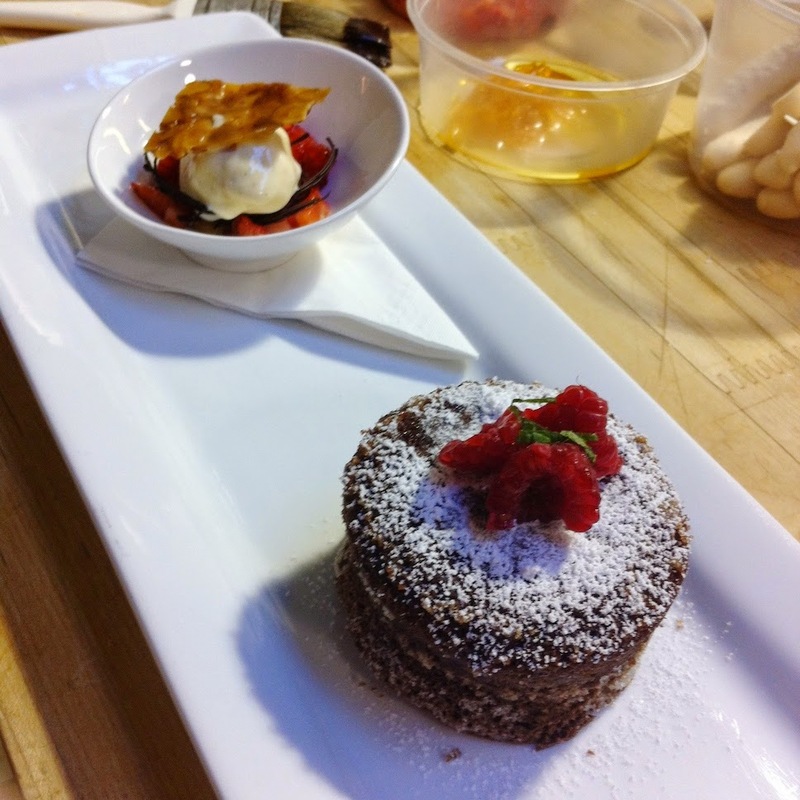 Molten chocolate cake with nougatine ice cream. We also had to make mini versions of these desserts called mignardise. 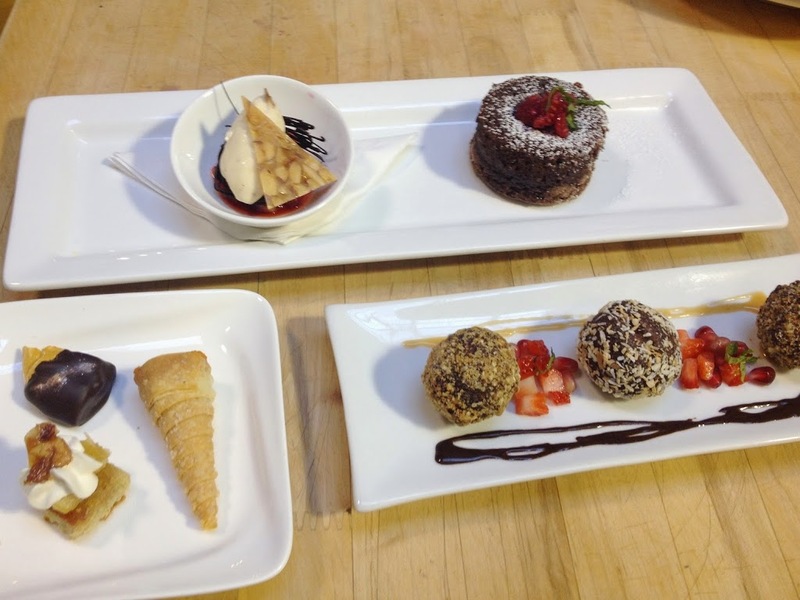 Here’s a picture of one round of orders… molten chocolate cake, mignardise for two, and a curveball order of rum balls. Thankfully Lindsay remembered that there were some in the fridge and did an awesome job at plating them! It was another long and exhausting day, and we were happy to move on from plating and service, but we will have to do it again for our final menu development project in a couple weeks. This was a relatively short day for us. 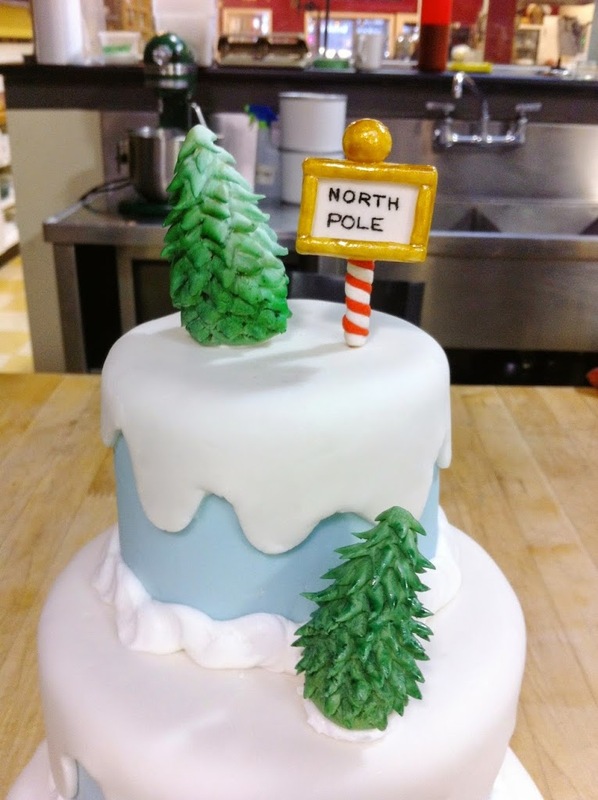 It was Day 1 of our three day cake project, and consisted of baking the cake layers and making buttercream and fondant to use the following day. We decided to go with a pound cake, as it’s more dense and has better structural integrity. 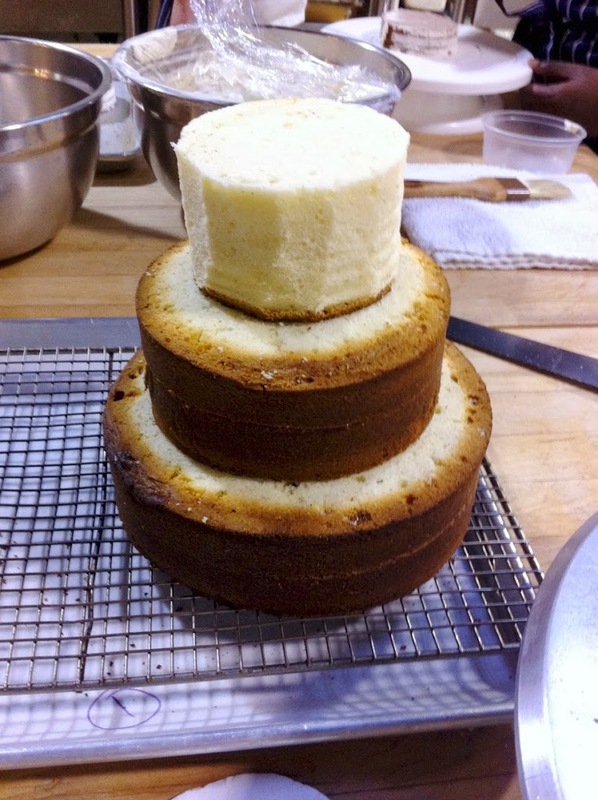 This was a 3-tier cake we were making, and we wanted to make sure it would be sturdy. 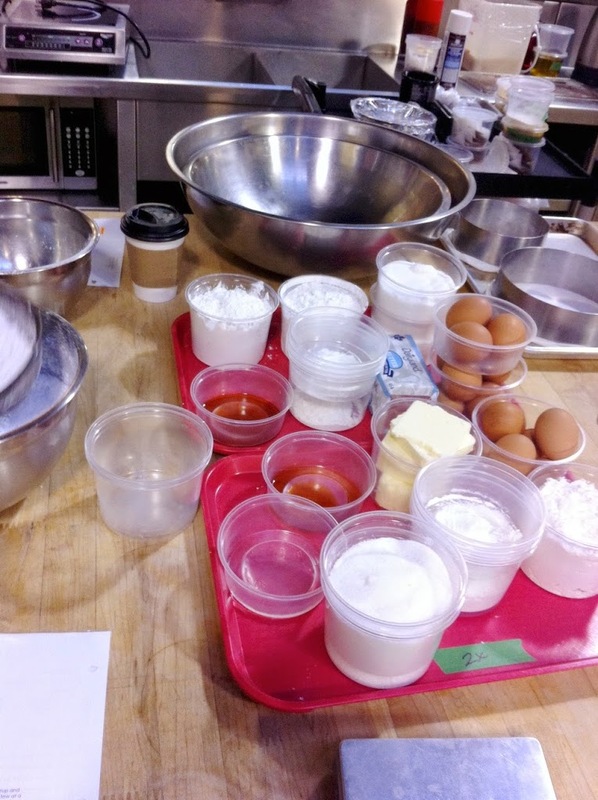 In order to make so much cake, we had to 5x the pound cake recipe in our curriculum and break it up into two batches. We split one into a 2x and one into a 3x. Here are the two trays with the ingredients for each. It was a LOT of cake batter! 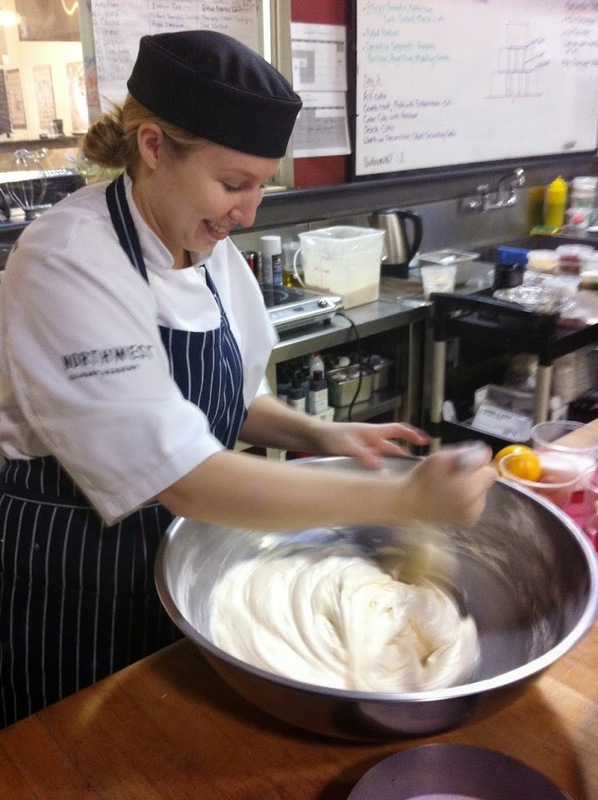 Here’s Lindsay mixing the 3x recipe. In hind sight this was a bit too much batter… 4x would have been enough. We ended up making an extra 6″ cake. Thankfully Laura and Haylee were a bit short, so they ended up using our extra cake. The cakes took forever to bake. Well over an hour, probably close to two! 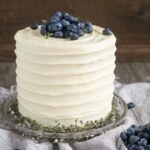 I was hoping we’d have time to layer and ice them today, but we were done all of our other recipes as the cakes came out of the oven, and they were still too hot. So we left a bit early and planned to relax for the rest of the afternoon. Apparently my version of relaxing is getting groceries, making stew and a double batch of coffee macarons for my dad’s birthday this weekend, and trying to come up with various recipe combinations for the Black Box on Monday. Not quite what I had in mind when I left school for the afternoon. I have a hard time doing nothing these days… I used to be so good at it! 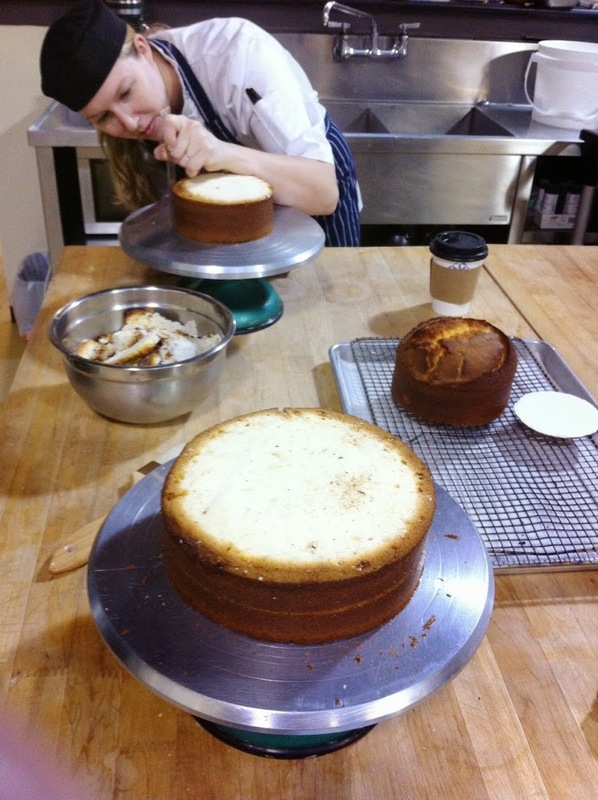 First up today was layering our cakes, and we wasted no time getting to that as soon as we got in. We had a lot planned for our cake and wanted to get going as soon as possible. We may be perfectionists, not sure though – I’m sure everyone uses a ruler to make sure cake layers are exactly the same height, right? 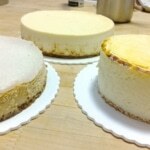 The tier you see on the right is a 6″ that we’d need to carve into a 4″ for the top of the cake. Here they are all stacked together before frosting! I should mention that by this point I had cut myself 3 (!!) times already. Twice trying to layer the cakes — the pound cake is way more dense than the sponge cakes we’d layered before and as such, more force was needed when cutting. I used a bit too much force and sliced my finger and then the palm of my hand. They weren’t bad cuts, borderline paper cuts, but they were bleeding so I had to band aid them and wear a glove for the rest of the day. The third cut happened when I was doing dishes. I grabbed a spackle knife at an awkward angle and it cut my OTHER hand. No joke, this was all before 10am. Not a good start. 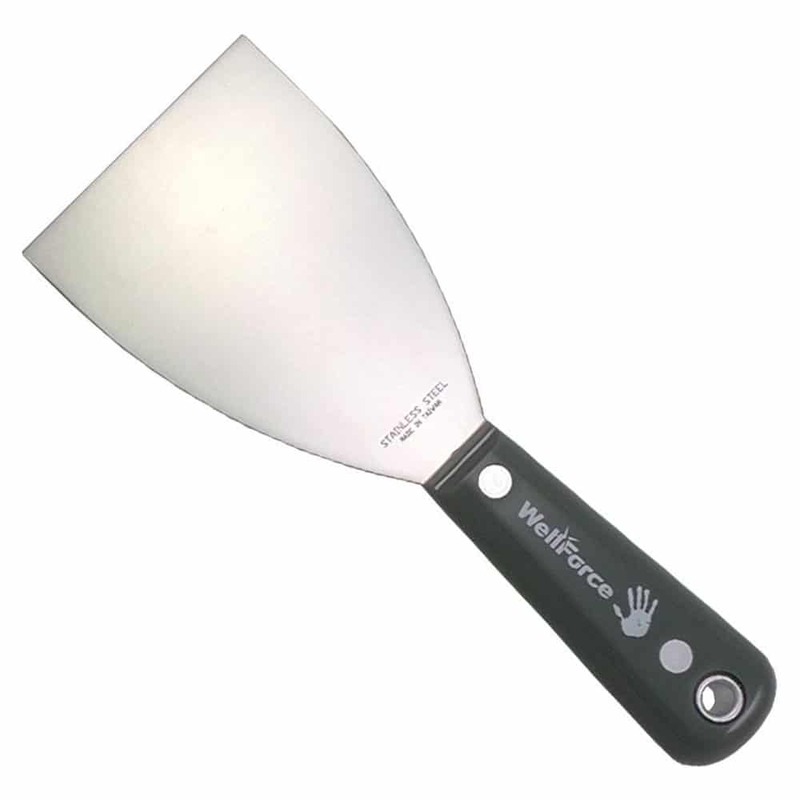 There would be a fourth cut at the end of the day on the plastic wrap serrated cutter thingy. Each hand had two injuries at the end of the day. 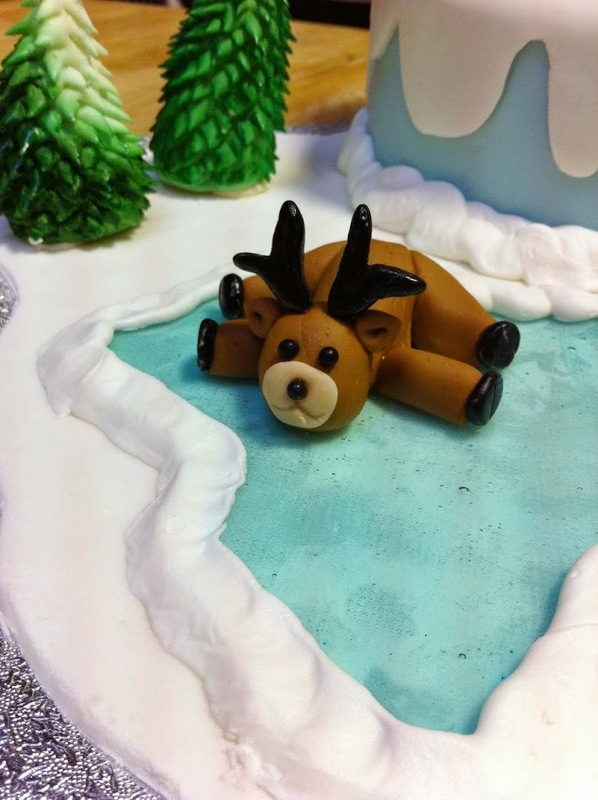 Aside from the injuries, there were other things that weren’t going so well… namely our fondant. It was dry and crumbly, and no amount of shortening or water would fix it. We tried some other fondant that was left over from before and had the same issue – we just couldn’t get it to the right consistency. It was so frustrating! We spent almost 2 hours kneading our fondant in chunks trying to fix it. Nothing would work and we were close to losing our minds. 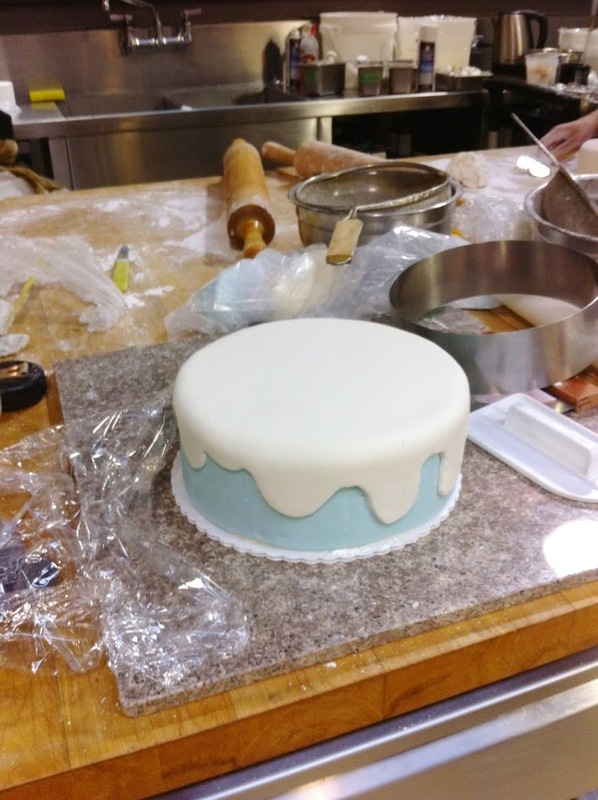 We couldn’t roll out the fondant in its current state – it would just crack all over the place. I was so close to driving to the store to buy some fondant, I swear. The cuts on my hands and wearing gloves certainly didn’t help with the kneading, either. Thankfully, Chef Stacy came over to help us. We tried nuking it in the microwave for 5 seconds at a time to warm it up, but that didn’t really do much. Then, a happy accident. I think Chef Stacy must have pressed the 5 second button twice by accident and set it for 55 seconds. 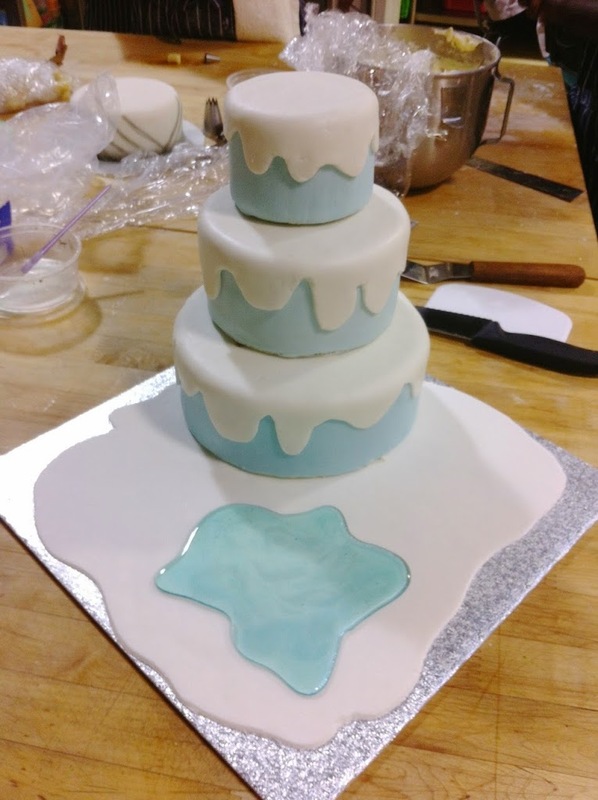 The fondant was in a puddle when we opened it. Chef Stacy tried to salvage as much fondant from the microwave as possible, about half of it was completely dried/caked on there. 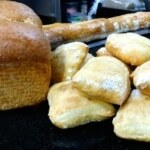 The stuff that was saved was really hot, but after some kneading it ended up becoming the perfect consistency! So using that trick, we nuked the rest of our fondant pieces in 5 second bursts until it was really warm and soft. 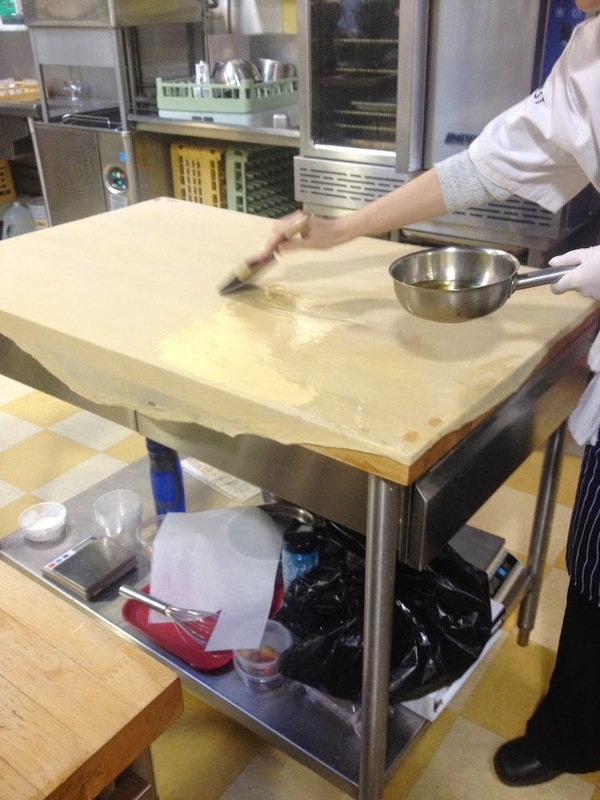 Then we’d knead it a bit to cool it down before we rolled it out. Crisis averted, but Lindsay and I have both sworn off making our own fondant ever again. Ever. 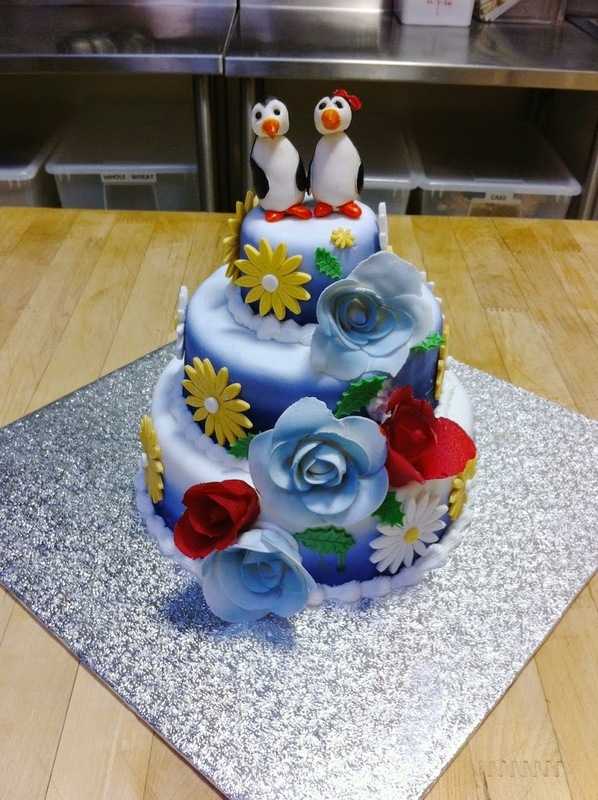 Finally, we could color our fondant and cover our cakes. Here’s the bottom tier. Ryan was shocked at the mess in the background when he saw the above pic. It was honestly much worse at some points during the day! After the cakes were covered we moved onto trees. 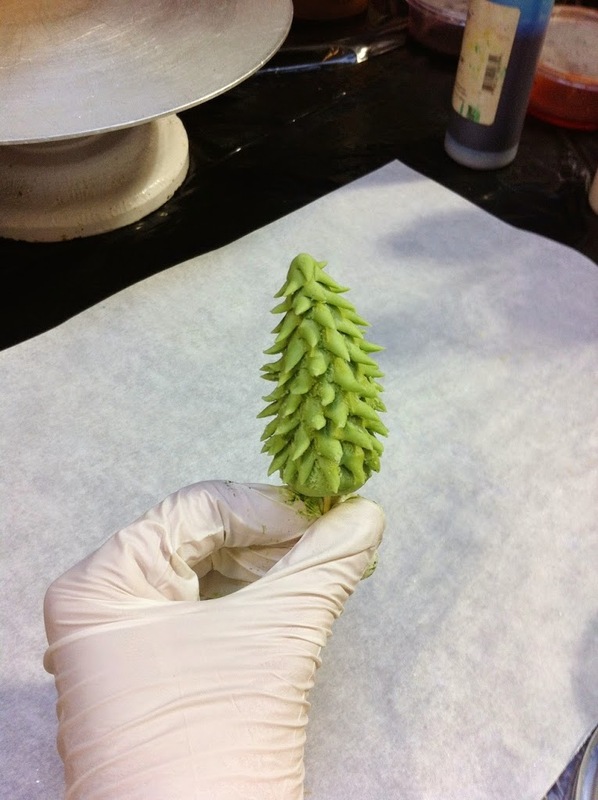 To make the trees, we formed a cone-like shape with the fondant and used nail scissors to cut into it, offsetting each row. 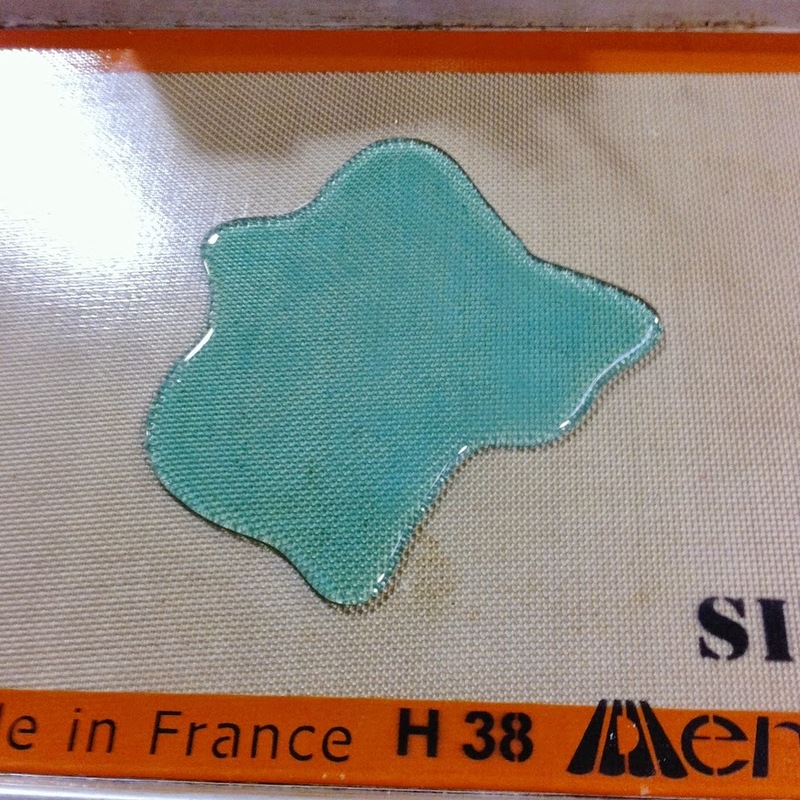 We ran into another issue where the gel colors I bought were dried out and virtually unusable. Some of Chef Stacy’s were in the same state. We colored as much of it as we could, then decided to airbrush the rest. Airbrushing actually worked out better in the end, and we should have gone with that from the start! 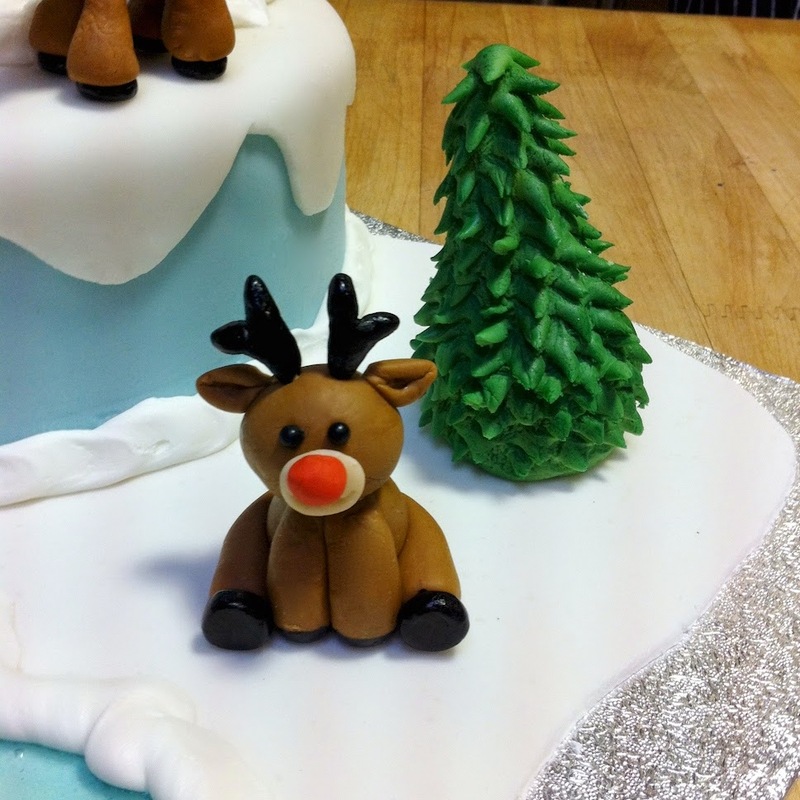 After we had some trees done (which again took much longer than expected), we moved on to the reindeer. 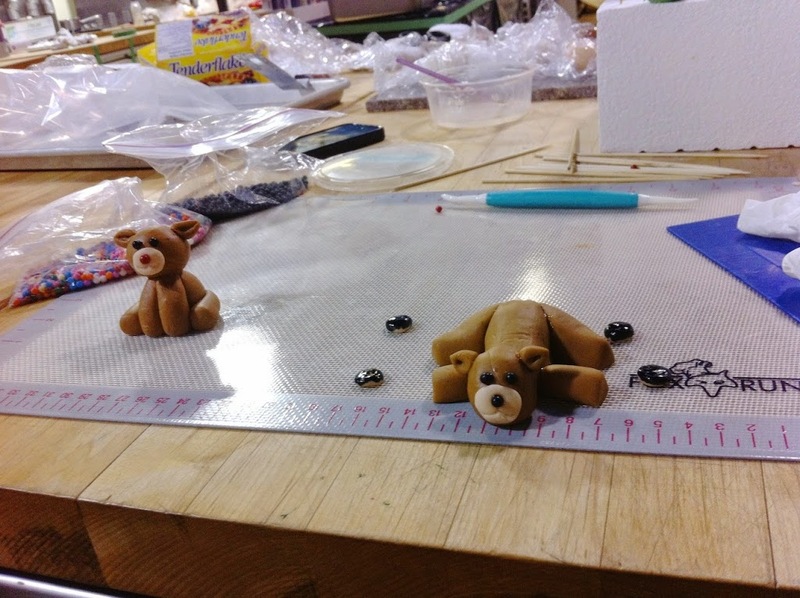 “Awww, cute teddy bears” everyone would say as they walked by. They are NOT teddy bears. Dammit. Ok, they kinda look like bears. They need their antlers and hooves. We painted the antlers and hooves and let them dry overnight. It was a long day for us, and more frustrating than we wanted. At the end of the day we had 5 trees done (planned for 10) and 3 reindeer mostly done (planned for 5). The third reindeer was done really quickly at the end of the day and neither of us were super happy with him, but whatever! We ran out of brown fondant! 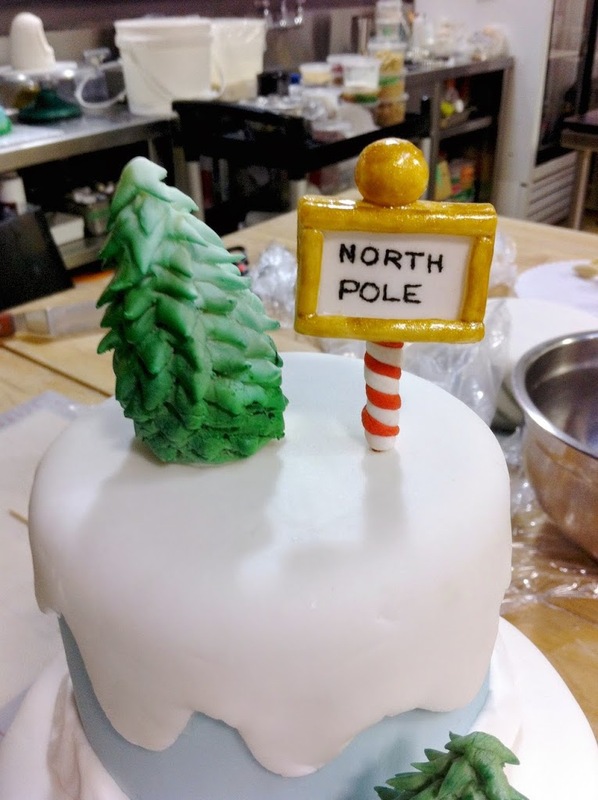 We still had a lot we wanted to do tomorrow: maybe making more trees, assembling the reindeer, making a lake and a North Pole sign… never mind stacking the cakes and covering the cake board in fondant! First up today was putting these little guys together. While I started to work on the North Pole sign, Lindsay started to boil sugar for our lake. Once it reached the right temp, she added a bit of color and freeform poured it onto a silpat mat. I LOVE how this turned out!! Its honestly better than I expected, and the shape turned out perfect. Yay! 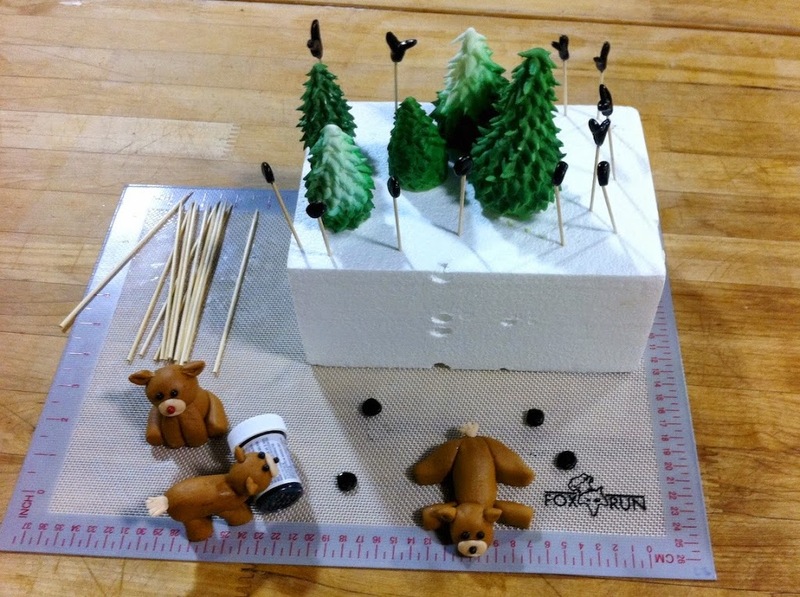 Here’s our bare bones cake, board, and lake, ready for final touches. 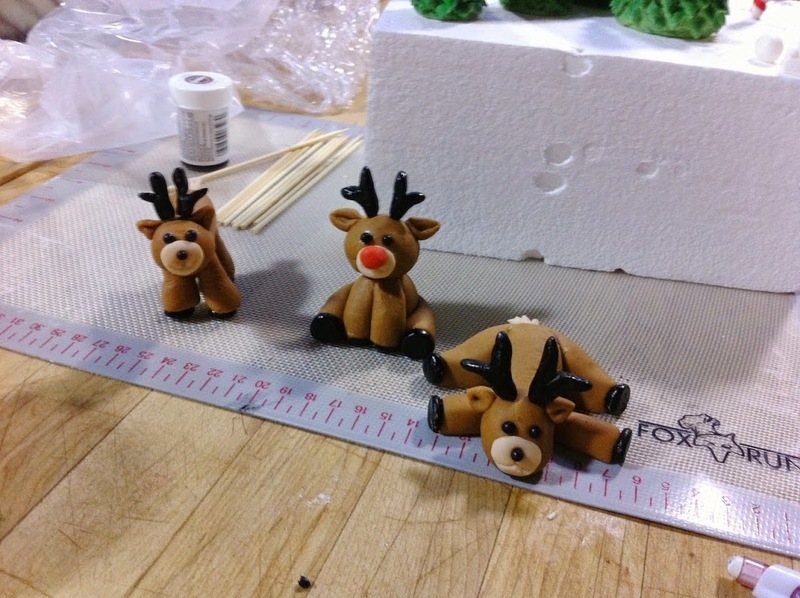 We offset each layer so we would have more room for placing trees and reindeer on the tiers. Also really happy with how the North Pole sign turned out. The writing could be better, but it was hard to do. I practiced with a few different options and settled for a toothpick dipped in black airbrush color. Love the gold on it! Chef Stacy had a gold glaze that I mixed with some gold shimmer and painted on. We had another happy accident with the trees. We ran out of green fondant (and really didn’t want to color more), so Lindsay decided to grab a chunk of green and a chunk of white and form them together. The effect made it look like snow! So cool. We airbrushed some additional green on there to blend it better. Lindsay’s super cute flopped reindeer. Lindsay also made a couple of additional trees today, as we needed a few more to fill the cake out a bit. 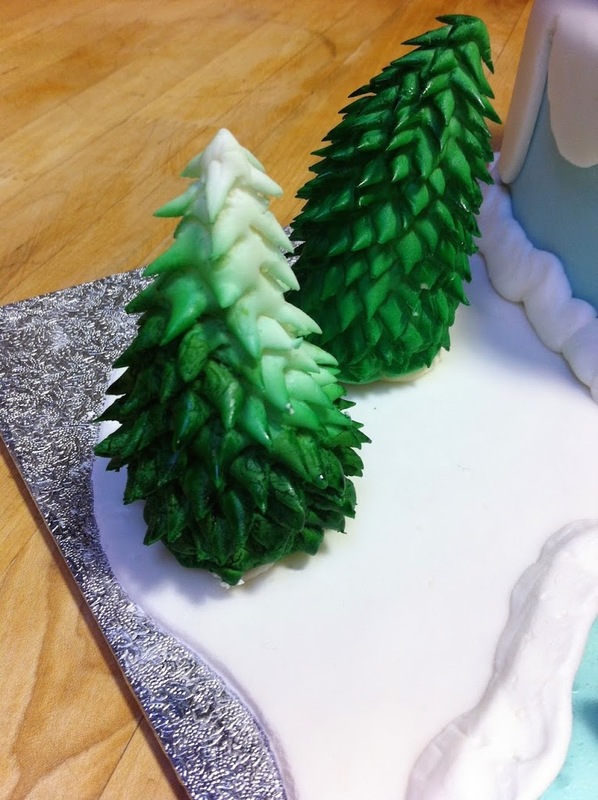 This time she used straight up white fondant, cut the trees out, and airbrushed green along the bottom. So. Much. Easier. than coloring fondant. 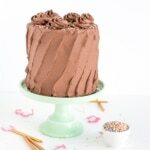 Here are pics of everyone else’s cakes. 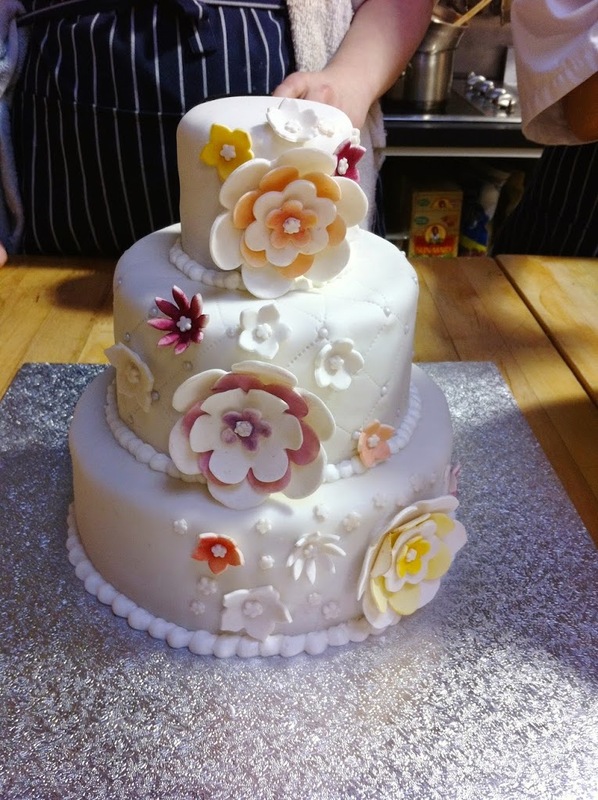 Laura and Haylee’s flower wedding cake. Hogan and Max’s winter penguin theme. 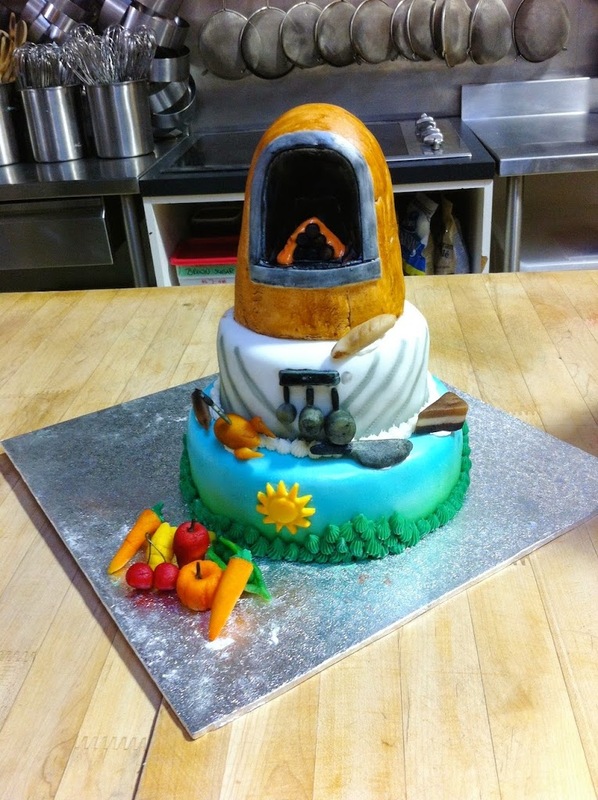 Trinesh and Lai Lai’s farm cobb oven cake. 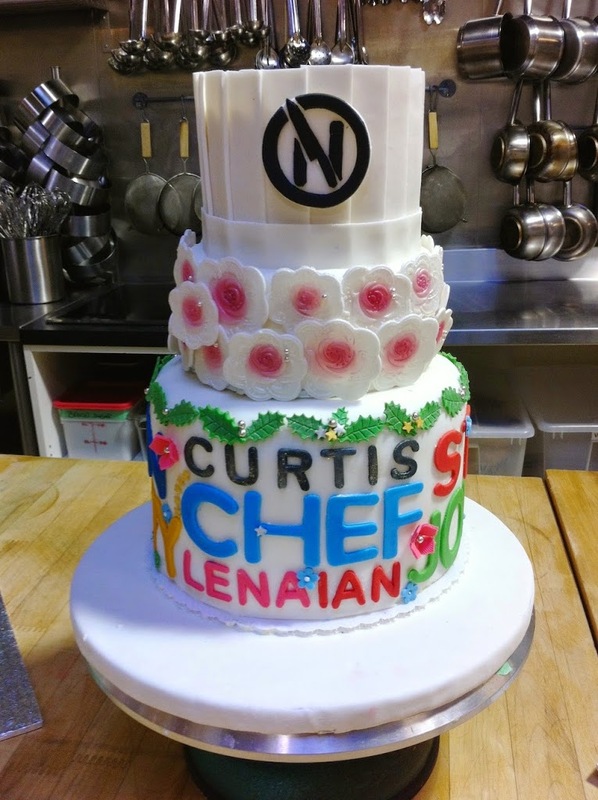 Sophia’s Northwest Culinary Academy cake with all the Chef instructors’ names on it. 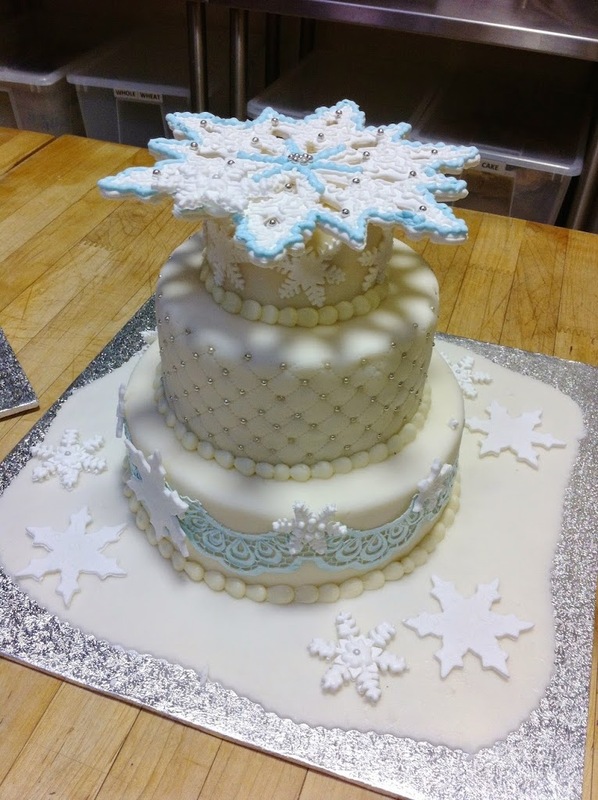 And finally Chef Stacy’s winter snowflake cake. 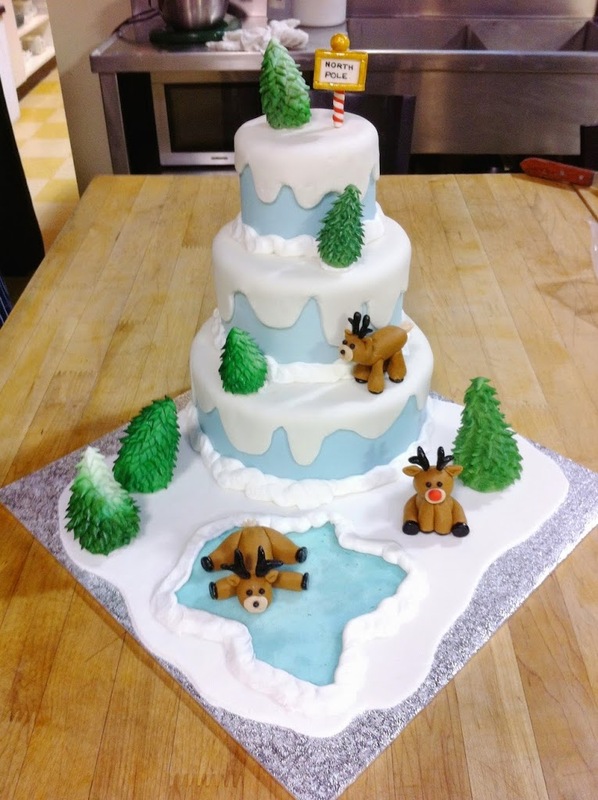 The huge snowflake on top was initially standing perpendicular to the cake, but it was too heavy and fell over. It looked awesome though! We had planned to take our cakes home on Friday, but ended up leaving them as Google was coming on the weekend to take interior pics of the school for a “street view” type thing. Leaving our cakes there meant they’d be in the shots. Pretty cool, right?? Tomorrow is the most stressful day of the program for me, and I am dreading it. It’s Black Box day, where we come in and get a (somewhat) random list of ingredients and specific things we need to make with those ingredients. 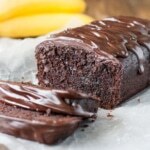 Even though we have a list of the possible things we could get and I have come up with a bunch of recipe combinations and options, it is basically my nightmare and I can’t wait until the day is over. I’m not good at improvising or winging it, and I don’t like to experiment unless it’s on my own terms. I like to have a clear plan with clear directions of what to do and how to do it. I could never be on one of those food competition shows. Seriously, how do people do it? ?